Smalley has over 6,000 Spirolox® Retaining Rings in 302 and 316 stainless steel from stock in 1/4" to 16" diameters. Specials can be manufactured from .200" to 120". Smalley's manufacturing process allows for the economical production of stainless steel rings. Free samples are available of stock parts to test in your application. A newly developed miniaturized electronic fuel injection (EFI) system designed especially for small combustion engines now provides the benefits of fuel injection, long enjoyed in larger engines, for small unmanned aerial vehicles (UAVs). The most striking characteristics of this system are higher performance combined with reduced consumption and considerably increased reliability. Microdrives are used to power the fuel pump to ensure the correct pressure in the fuel system. U.S. Army officials at Aberdeen Proving Ground in Maryland announced the winners of this year's Army's Greatest Inventions competition Sept. 19. A team of combat veteran non-commissioned officers, as well as U.S. Army Training and Doctrine Command field-grade officers, reviewed and voted for the Army Greatest Inventions that were fielded in 2011. The top 10 winners include a 120-mm guided mortar cartridge, add-on-armor kits for MRAP vehicles, and a force-detecting and -reporting sensor system integrated into Soldiers' helmets. 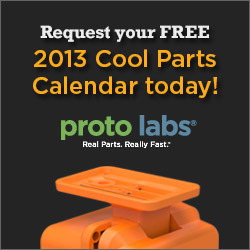 Click the ad above to get your 2013 Proto Labs Cool Parts Calendar. It's full of information on injection molding and CNC machining, industry tradeshow dates, and more! The future looks blazingly bright for new applications of energy generation through thermoelectric harvesting. Using a novel method of integrating video technology and familiar control devices, a research team from Georgia Tech and the Georgia Tech Research Institute (GTRI) is developing a technique to simplify remote control of robotic devices. Sauer-Danfoss has introduced two robust mobile machine management solutions that aim to help OEMs reduce vehicle development costs and accelerate time to market. The new TorqSense RWT410/420 torque sensors with integral electronics from Saelig, which replace the RWT310/320 series, feature significant performance gains in resolution, frequency response, reduced sensor current consumption, and faster digital data throughput. Transducer overload capability has also been increased to 300%. The series offers a cost-effective, non-contact digital rotary torque measurement solution, using TorqSense Surface Acoustic Wave technology, suitable for torque monitoring, testing, or controlling drive mechanisms. Sealing specialist Trelleborg's iPhone app "Unit and Hardness Converter" surpassed 100,000 downloads in just the first five months of its release. This app helps you convert frequently used, basic engineering units and even worldwide currencies in an efficient and convenient way. It comes with a hardness converter based on ISO and ASTM standards to quickly switch between popular hardness scales for various material types. 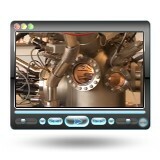 The app can be used in a wide range of design situations, whether related to sealing or not. No charge. Available from iTunes or Apple App Store ("Trelleborg Converter"). Find out more about this app. Design engineers can easily add Wi-Fi connectivity to their products using new Microchip Technology Wi-Fi modules based on Roving Networks technology. These solutions use a simple serial interface to connect with any PIC microcontroller, and expand Microchip's wireless portfolio with the industry's lowest power consumption along with an integrated TCP/IP stack in a certified Wi-Fi solution. 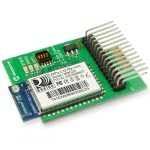 The Wi-Fi modules support all of Microchip's 8-, 16-, and 32-bit PIC microcontrollers. 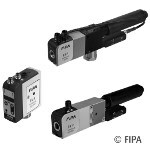 FIPA ejectors with air-saving function save energy without compromising cycle times. Equipped with automatic pressure regulation, EKPP, EKP, and EMM series ejectors can reduce compressed air usage by up to 50% per workpiece, regardless of its porosity, and save up to 97% for airtight workpieces. These ejectors never use more than a very low 50.8 psi, regardless of the actual feed pressure. 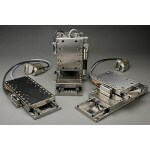 Mini-MAG (MMG) precision linear positioning stages from Dover are now available with a complete and optimized controls package. OEMs and end users can combine an MMG linear motor stage with a compact Dover board-level, single-axis servo drive for easy integration into a control cabinet. Or try integrating a stage with a Kollmorgen AKD servo drive for single- or multi-axis applications and get real-time performance feedback. Both options provide Ethernet communication for fast data acquisition. Downloadable CAD files are available from for easy integration into customer models. A penny-size rocket thruster may soon power the smallest satellites in space. The device, which runs on jets of ion beams, bears little resemblance to today's bulky satellite engines, which are laden with valves, pipes, and heavy propellant tanks. DARPA demonstrated a robotic prototype of the Legged Squad Support System (LS3) in Virginia Sept. 10. This unit is the latest iteration of Boston Dynamics' famed BigDog robot. One of the more "far-out" Phase I concepts recently funded by NASA is called "SpiderFab," which basically entails 3D printing large structures in space instead of fabricating them on Earth and launching them. 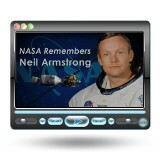 Take one small step to learn a little bit more about Neil Armstrong by watching this NASA tribute video. U.K. scientists at the University of Nottingham have discovered a new class of polymers that are resistant to bacterial attachment. The development could lead to a significant reduction in hospital infections and medical device failures.